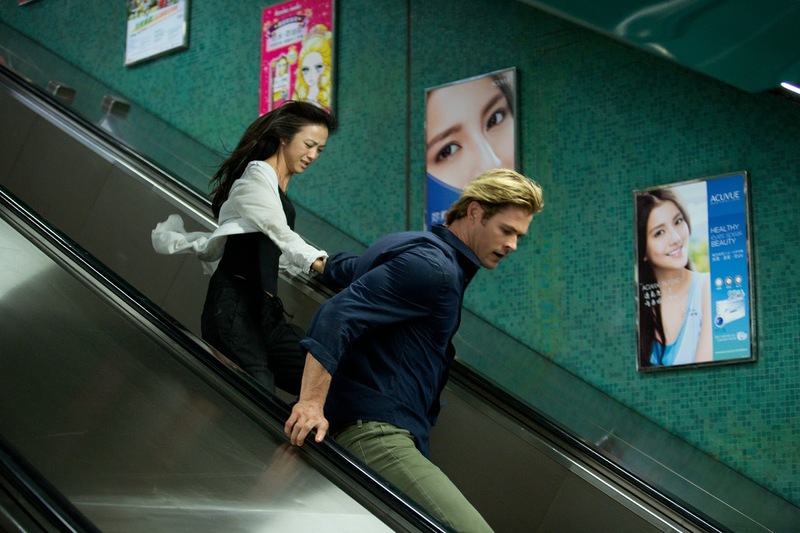 The worst thing about Blackhat is simply how forgettable it is. The fact the title is something of a hacker term, unrecognizable to the common consumer and doesn't spark much interest makes it something of a task to even get people interested, but when the film itself turns out to be tedious and rather dull, the case is only worsened. It might have been better had the film gone out under the name, "The Untitled Michael Mann Project," but then again, audiences have been somewhat dissonant with the well-regarded filmmaker as this will mark his third film in a row where expectation likely don't meet reality. Since discovering the director for myself in 2001 with Ali and being riveted by his follow-up, 2004's underappreciated Collateral, I've always looked forward to what he has to say next. Most will know him for helming Heat, Last of the Mohicans or even Manhunter all of which were interesting to go back and watch after seeing Collateral and experiencing the evolution of his style all at once, but with Blackhat the director seems to be on autopilot. A black hat is essentially a fancy word for a hacker or someone who violates computer or internet security maliciously or for illegal personal gain. In the film, both our protagonist and our antagonist are classified under this title, but one is looking to redeem himself while the other is simply in it to see how creative he can be in order to get away with more than a few major crimes and terrorist acts. Mann clearly wants to bring his style and sense of storytelling to a topic that is both relevant and lightly documented. This is obviously a fine enough goal to have, but the final product is little more than a standard police procedural with a topical twist. With that, one walks away from the film feeling unmoved as none of the characters are completely endearing and while their plight can become interesting at points it in no way resonates, it in no way leaves an impression, but rather washed over me with an attitude of being unimpressed or indifferent to anything the villain was doing because they (the good guys) already knew they'd eventually outsmart him. This isn't exactly what you might call fun though and so we (the audience) end up feeling the same way as our intended heroes- unimpressed and indifferent because we've experienced and seen this movie so often before. 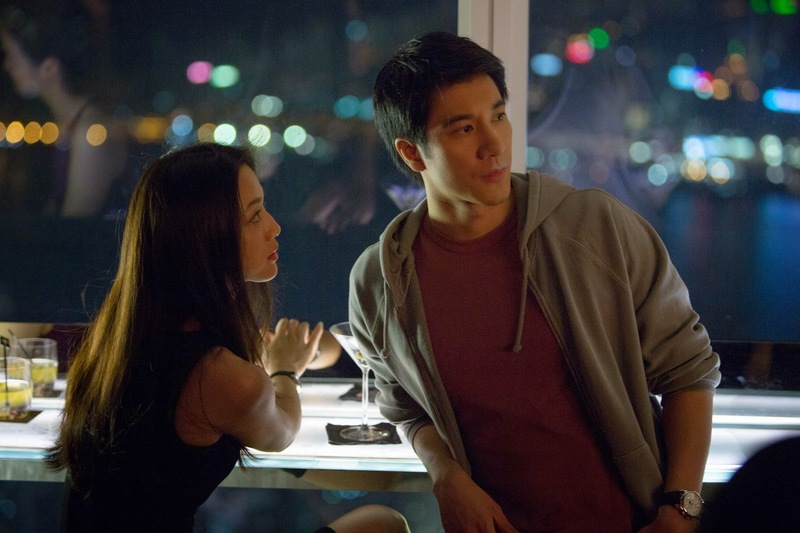 Lien (Wei Tang) is recruited by her brother, Dawai (Leehom Wang), in an effort to stop a hacker. The film begins by taking us on a stroll through the inner-workings of a computer. Completely navigating the world of a full CGI environment Mann seemingly wants these opening moments to give the audience an immersive look into the world of his main characters and what their brains detail every day, but instead it looks more like something akin to a nineties show on Fox Kids Saturday mornings. Eventually making it out of the computers, we realize the actual point of seeing ourselves through the information highway was so that the hacker, or "blackhat"-excuse me, could set off a nuclear explosion in China. This is obviously big news and puts into motion the events that become the main narrative as an investigative team is sent in to figure out the source of the attack and to apprehend the culprit before he can strike again. Sounds familiar, right? It is, but Mann wants to make it a detecive story for a brave new world and unfortunately that sense just doesn't come through in his effort. The investigative team is led by Dawai (Leehom Wang), a Chinese defense officer of some sort that is proficient in his knowledge of computers and an expert on cyber attacks. He takes his sister, Lien (Wei Tang), who I'm still not sure how she figures into being necessary to the United States, where they meet with U.S. Department of Justice member Carol Barrett (Viola Davis) and convince her they need Dawai's number two man on the job if they want to make any real progress. It just so happens Dawai's number two is his MIT roomie Nicholas Hathaway (Chris Hemsworth) who is now a convicted hacker serving fifteen years in prison for hacking into something and bankrolling himself and a few of his friends. That's what I gathered anyway, his past motivations aren't clearly defined and what we should expect from him coming out of prison is all but uncertain. Hathaway is furloughed and sets up a deal where if he catches the baddie he is free forever and if not, then he'll willingly serve out the rest of his sentence. Players are in motion, start the clock. It would be nice if the film were actually as straightforward and direct as that previous sentence, but instead the screenplay is where we find Blackhat running into most of its trouble. From the beginning we are unfamiliar with who these people are in their daily lives and what they might bring to the table of the main plot, much less what exactly they're doing in order to crack the case. Computer/hacker jargon is thrown around with little explanation while Hathaway is the only character we feel we really get to know and most of that is simply because he is the clearly defined lead and not necessarily from Hemsworth's performance. That isn't to say Hemsworth puts forth a bad performance, he is perfectly fine here and contrary to popular opinion I kind of like the idea of this against type persona portraying what we generally perceive as the stereotypical nerd behind a keyboard. Hemsworth, putting on something of a northeastern American accent, brings his bulk to a role that requires a bloody brutality, but is of course of more importance for his intelligence and insight. The actor has an inherent credibility in his presence and therefore we buy into not only the idea that he could serve as a gifted hacker and person of interest, but that he also has the brawn to physically take on the bad guys in some of the only real moments of tension here making the more explicit violence in the film all the more believable. If anything, Hemsworth is Blackhat's greatest asset. Not faring so well is the supporting cast, mainly Wei and Leehom who are brought in so abruptly with no definition of who they are individually or where their relationship is at as siblings that where the film builds to has less of an impact and simply exists on the basis of their inherent relationship. In short, while Davis is always reliable and is especially endearing here as a sassy ally, the script muddles the character development to the point that we don't care how carefully placed each step in the investigation has been set-up, but rather realize that since the character arcs are essentially non-existent there isn't much to care about. Hathaway (Chris Hemsworth) leads Lien away from the onslaught of gunfire coming towards them. Furthermore, a director such as Mann should have realized this, if not while shooting at least while editing the film. His vision is clearly present all over the finished product as his digital cameras move in to their intimate angles and capture the facial expressions of his actors with such a veracity that we feel we're there with them, but this matters little when we don't fully care about them or understand their motivations and predicaments. If the cast of characters had been trimmed down to the essential Hemsworth, Davis, Leehom and Holt McCallany, who plays a U.S. Marshall and the only character I somehow came to care about, while cutting the love story completely between Hathaway and Wei then we would have experiences a better realized a more focus film. 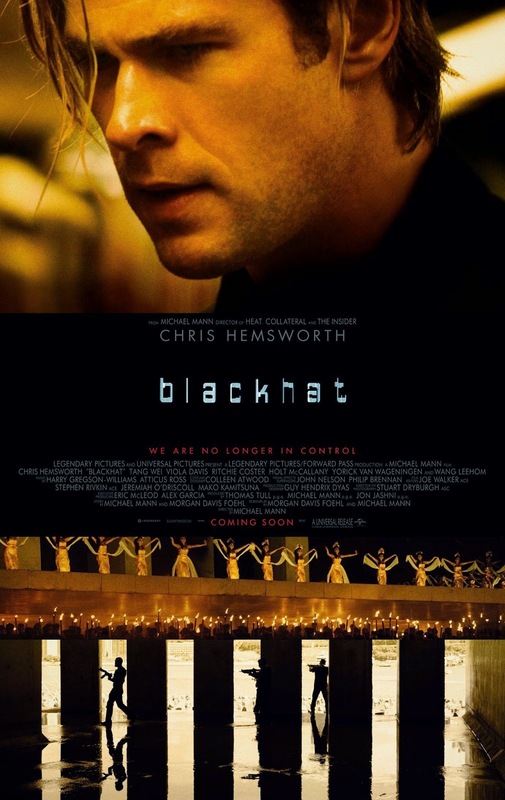 At two hours and fifteen minutes Blackhat is also half an hour too long and in cutting the romantic angle, allowing more time to flesh out the necessary characters at the beginning and then diving head first into the main objective of finding out why this hacker garnered $74 million in cash and is still writing code then we might have had something worth sitting up for. I'm not here to say what the movie should have been though, I'm simply here to discuss the film we did receive and unfortunately, despite all its well-pedigreed factors, Blackhat lives up to the stigma of January being a dumping ground for studios. At the risk of sounding like I completely hated the film, I will say that some of what Mann has going on here becomes of interest and I understand that the love story exists to set-up the complexities of the latter half of the film, but in allowing this underdeveloped relationship into the narrative it also allows the film to devolve into this standard man on the run tale that doesn't care what its mission is and could be anything, but just so happens to deal with cyber terrorism. The film allows the genre to define it when the film should in fact elevate the genre. It's clear what Mann wanted to accomplish with this film and as much as one would like to commend his efforts, even those who don't see hundreds of movies a year will no doubt find Blackhat a lackluster action/crime/drama that doesn't live up to its potential.